On a cold Friday night after work, what could be better than going out for a fabulous dinner somewhere warm. That is exactly what Tim and I did last night. The venue for our dinner was Guhng, a Korean barbecue restaurant just off Little Collins Street. I was kind of excited about it, because we had tried to go to Guhng once before on spec and couldn't get in. This time, I booked. They have two sittings on Friday nights - 6pm and 8pm. We chose the 6pm sitting as we were going straight after work. On arrival at Guhng, I ordered a green tea, and Tim ordered a beer. We decide to choose one of their set menu banquets, which are great value. You can choose from set menus for 2, 4 or 6 people, and the prices vary from $30 per head, depending on the menu you choose. We chose the 2A menu ($30 per head), comprising 3 courses. The table is set with metal chopsticks a metal spoon and condiments on arrival, and side dishes are served shortly thereafter. The condiments are, left to right, spicy soy bean sauce, sesame oil with salt and teryaki sauce. The side dishes are pickled onions, pickled turnips (which are a gorgeous hot pink colour), kimchi and coleslaw with pasta. There are also lettuce leaves provided to line your bowl. These were a nice starter, especially when dipped in the condiments, but did not have much of a flavour kick. The sides are replenished as you want them - we had three top-ups in all. It was a frozen cheesecake, and tasted like icecream. The icecreams themselves (which we didn't order) are served in a spectacular fashion on a rectangular plate encased in a chocolate swirling disc with a smear of chocolate on the plate. I liked the cheesecake, but wish I'd opted for the icecream! Tim and I loved this place - for the money, it was terrific value. The food tasted fabulous, and the wait staff were attentive and friendly. There are three levels of seating in Guhng, but I recommend booking due to its popularity. I also noted that there were lots of Asian diners in Guhng - I think that is always a true indicator of whether an Asian restaurant is good. Verdict - definitely going back! For this week's French Fridays with Dorie, we were asked to make a dish which seemed all American rather than French - corn pancakes. However, I will have to take Dorie's word for it that they are indeed of French origin. These little pancakes consist of nothing but corn and flour and egg and salt - seriously. You blitz the ingredients in a food processor, and fry small spoonfuls of the thick batter in a skillet of hot oil. Definitely not hard or time consuming. I made a half batch and ate it for a weekend breakfast. I simply spread my pancakes with honey. The recipe said it serves six, but I gather this is when you serve the pancakes as a side with other things, so I don't think that eating a half batch myself was particularly gluttinous, bearing in mind that these pancakes are tiny. The verdict? Pancakes are pancakes - these were neither better nor worse than any other pancakes I have ever had, but may be nutritionally better for you than the normal flour egg and milk version because of the corn. Dennys became the eatery of choice for many on our bus tour because of the generous servings and afforable price. Our tour director called it "Chez Denays". These pancakes stumped me - I got two whole-wheat pancakes, which came with sides of maple syrup, whipped butter, two pieces of bacon, two eggs (sunny side up in my case) and potatoes. I became all flustered when ordering, as I could have also added add-ins to the pancakes (such as bacon bits or chocolate chips), and ordered another topping (strawberry syrup anyone?). This was the standard serving - I did not ask for all of this with the pancakes. Wow! I think it cost $5.95 - you'd never get this for that price in Oz. To see what the other FFwD people thought of the corn pancakes, visit the LYL section of the FFwD website. This post is devoted to the many sweet (and otherwise) munchies that I sampled during my recent trip to the West Coast of the US. My US readers will instantly recognise many of these items, but they are novel to me and my Australian friends, and I think that they will find at least some of these things interesting. I really liked the corn nuts - they are not sold here, and I liked the crunch of the corn kernels- a nice change from potato chips. I was also interested to see that Skinny Cow makes chocolates - in Australia, you can only get Skinny Cow icecream. My favourite out of these was the salted caramel filled chocolate - absolutely devine! The nougat centre was OK, but the chocolate covering it was compounded and plastic-tasting. I would definitely buy this again - so creamy! This stuff is addictive! I loved it so much that I bought more of it in Monterey. I am glad that I was given this as a sample, as I really didn't fancy the strong cinnamon flavour. The Black Pearl Bar contains ginger, wasabi and black sesame seeds, while the Cherry Rooibos Bar contains African rooibos tea and dried Michigan cherries. I am yet to try the cherry chocolate, but the Black Pearl Bar was fairly tame - the distinctive flavours didn't really stand out from the chocolate. It was as good as it looks - although I ditched the cream. The cherries were great, but again, I wasn't that enamoured of all the cinnamon in the apple pie logs. Trader Joes became my favourite US supermarket chain for their range and their prices. I liked the Fiberful bar so much I picked up a couple more of them in Los Angeles. The speculoos bar was not really my thing, but was fun to try. This was a thick paste made from the whole quince. It was brilliant spread on warm crumpets for breakfast. I bought a piece of each of Tiger Butter (vanilla and chocolate fudge mixed with peanut butter), Red Velvet Cake and Salted Caramel Chocolate. My favourite was the smooth and creamy Tiger Butter. They had a terrific range of sweets there, so it was hard to choose just one. What's not to love about nuts and caramel and chocolate? I didn't buy this; rather, I chuckled because this product features in a spoof of Chloe Sevigny on YouTube that my pilates instructor told me about. 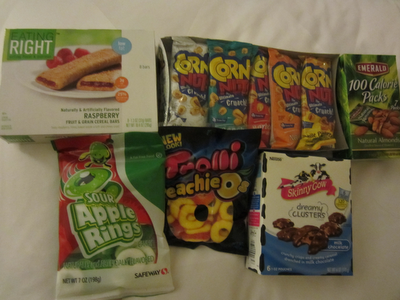 There you go - these are all of my West Coast munchies, many not so nutritious or waistline friendly, but they added to the colour and experience of my trip. Hope you enjoyed sharing them! On 2 June 2012, it was 60 years since Queen Elizabeth II was crowned as Queen of the British Empire, and unless you have been isolated from the media for the last month, you could not have missed all the celebrations that have been taking place for the Diamond Jubilee. This month also marked the 70th birthday of Sir Paul McCartney from The Beatles on 18 June. Accordingly, being a huge Beatles fan, I have made this month's Daring Bakers challenge both to celebrate the Queen's Diamond Jubilee and for Sir Paul's birthday. Battenberg Cake was first made for the wedding of Princess Victoria, Queen Victoria's granddaughter, on her marriage to Prince Louis of Battenberg. The four checks in the pink and white checkerboard pattern represent the four princes of Battenberg. I have never made a Battenberg cake before, although I have always wanted to try, so I went with the traditional colours (pink and white) and flavours (almond and vanilla) suggested in the recipe. The lovely tea towel which forms a backdrop to my cake comes from Anthropologie at The Grove in West Hollywood - it is mint green with a tea set print and embroidery. I love it! Life often presents us with challenges, big and small, that take us outside of our comfort zone. Sometimes, I feel up to the challenge and tackle it head on; other times, I skirt around it or duck under it or run away from it. Much depends on the day of the week, the mood I'm in and the kind of day I have been having. Some days, I feel invincible; on other days, just getting out of bed is a challenge. This week's French Fridays with Dorie recipe provided a challenge to my culinary comfort zone, a bump in the road - the recipe chosen was David's Seaweed Sables. Unfortunately, this recipe sounded horribly unappealing to me, as it combined nori (seaweed) and icing sugar in the same vehicle. It seemed like a massive clash of flavours to me. However, the recipe wasn't hard, so I decided on the "what the heck" approach and made those seaweed sables. And you know what? They were good. I will go so far as to say that David's Seaweed Sables are downright addictive, and I had to remove them from my office so that I would stop eating them. I figure my colleagues must have felt the same about them, because the remaining sables disappeared in a flash. Unconvinced? Make them, I say, and decide for yourself. The mysterious alchemy of sweet and salty creates a moorish mixture of flavours that cannot be resisted. To see what the other FFwD members thought of these sables, visit the LYL section of the FFwD website. Isn't he handsome? For an interesting novel involving a convict who eventually turns into weedy sea dragon, refer to Gould's Book of Fish by Richard Flanagan. I am back in Oz after spending 2 1/2 weeks on the West Coast of the United States. If you thought that I was unusually quiet, this is the explanation. I had a marvellous time on my vacation, and I will share parts of it with you in due course. It was bright and sunny and warm on the West Coast, and I have returned to miserable, cold weather, and have already contracted a cold. I would love to go back to that beautiful weather, if only I could, but alas, it is a beautiful fantasy, and I have to resign myself to reality. 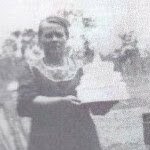 This week for Baking with Julia, our recipe brought back images of childhood, when in summer, my mother would bake sponge cake and fill it with cream and strawberries. Our recipe was French strawberry cake, based on a French sponge, the genoise, and filled with two layers of strawberries and cream, and smothered in more cream. My kitchen smelt devine after I baked this! To see what the other BWJ members thought of this cake, visit the LYL section of the BWJ website. This week's French Friday with Dorie recipe is Lime Honey Beet Salad. 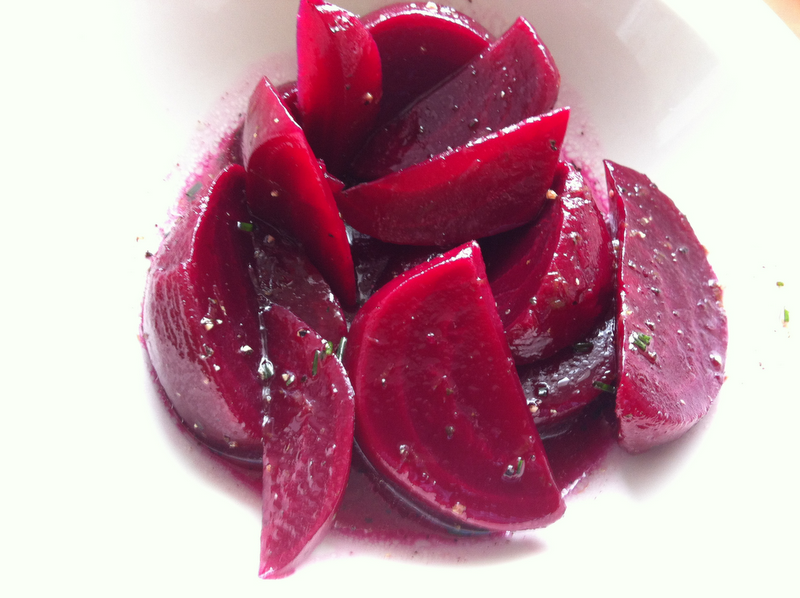 It doesn't sound like much, and to be honest, it isn't much - beet wedges are dressed with a dressing of cider vinegar (in my case, white wine vinegar), olive oil, lime zest and juice and honey. I like beets, and the dressing lifts them to another place, but I can't really think of this as a recipe. I was not going to cook beets because I hate dying my fingers purple in the process of peeling them, so I bought pre-cooked, canned beet wedges. I served it alongside whatever I was having for dinner as a side dish. To see what the other FFwD participants thought of this recipe, visit the LYL section of the FFwD website. This week's French Friday with Dorie recipe is a delight that I recommend you try at least once - Olive Oil Icecream. To me, the sound of olive oil in icecream didn't sound that attractive, but I am now converted. This is the best icecream that I have ever tasted, apart from Baskin Robbins Pralines 'n' Cream. It is smooth, creamy and oh so delicious - even in wintery weather. It would be the perfect accompaniment to any dessert, because it doesn't have a strong flavour, but it is also very good on its own. To see what the othe FFwD participants thought of this recipe, visit the FFwD website. 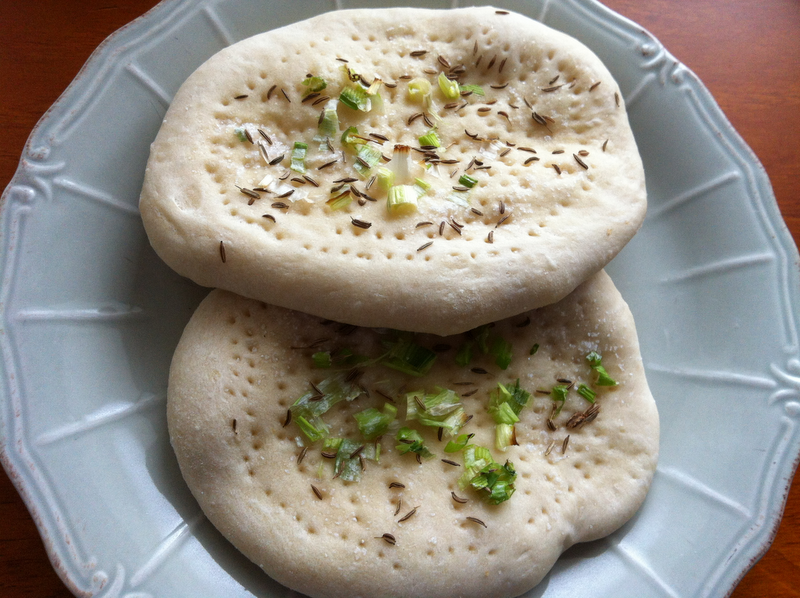 This week's Baking with Julia challenge is Oasis Naan. These nan really couldn't be easier to make - there's not much to them apart from flour, water and yeast, and chopped scallions, caraway seeds and salt for the topping. They are very non-attention seeking for a bread - once the dough is mixed, it sits for 2 hours to look after itself while it rises, then it is shaped and baked on a pizza stone for around 8 minutes - done. I only made a half recipe to get four naan. The naan taste good, but I was disappointed because they are nothing like naan that I would get at my local Indian restaurant, which tend to be light, pillow and could almost float away. To see what the other BWJ members thought of these naan, visit the LYL section of the BWJ website. This week's French Fridays with Dorie recipe is a surprising salad - Lentil, Lemon and Tuna Salad. It is a mixture of green lentils, tuna, chopped preserved lemon and chopped scallions, dressed with an unlikely combination of olive tapenade, mustard, red wine vinegar and olive oil. But weirdly, it works - I really enjoyed it. I was lucky in that I had preserved lemons that I had made from lemons out of my friends', Veronica and Christian, garden. This is the first time I used them, so that made me happy. Preserved lemons are absurdly expensive to buy, given how simple they are to make. I ate this salad warm - it was already 3 in the afternoon, and I had not yet had lunch, so I wasn't going to wait a couple of hours for it to chill (after patiently waiting while the lentils cooked).